A step-by-step guide to repolarising (or 'flashing') a Lucas dynamo to restore magnetism and correct operation. Repolarising a dynamo (sometimes also referred to as ‘flashing’ or ‘remagnetising’) is a way to ‘wake up’ generators that may not have been used for a long time, been incorrectly wired up in the past or are not producing any volts for some other reason. This guide describes how a Lucas dynamo works, why and when you might need to repolarise it, and how to go about this. It is also (probably) applicable to other makes and models of dynamo, but it is based upon the Lucas type “E3NL” dynamo fitted to my Matchless motorbike. A Lucas motorcycle dynamo can be thought of as a simple DC motor running in reverse. Rather than applying a DC current and getting out rotational movement as in a motor, you supply rotational movement from the engine and (all being well!) get out an electrical current. It should be noted that dynamos are DC (direct current) devices and are therefore very different to more modern alternators which, as their names suggests, are AC (alternating current) devices. The various components inside a Lucas E3 dynamo are shown in the exploded diagram below – click to view a larger version. Where a Lucas dynamo differs from a simple DC motor is that there are actually two sources of magnetic field within the unit. The first is a soft-iron core which is what retains the magnetism when the engine is not running. However, this is not a particularly good magnet and the amount of magnetism it retains is relatively small and certainly not enough to generate the 45-60 Watts required by a classic motorbike. But it is just about enough to get a small current flowing in the coil when the engine is first started. This is where the ‘field coil’ (a secondary coil within the dynamo) comes in to play. Some of the output from the generator coil is fed back into the dynamo through the field coil which then generates a secondary magnetic field (hence the name) of its own. This magnetic field is stronger than the residual field from the soft-iron core and therefore induces a bigger current to flow in the coil. More current is therefore supplied back to the field coil, giving an even greater field strength, more induced current in the coil, and so on until an equilibrium is reached for a given engine speed. Simple hey! The following guide describes the relatively simple task of repolarising (sometimes referred to as “flashing”) a Lucas dynamo and is applicable to models such as the E3N, E3M, E3NL, E3L (etc) as fitted to many classic bikes. It may also be applicable to alternative makes and types of dynamos fitted to other classic bikes and cars too, but you’ll need to work out for yourself which are the correct terminals etc. So why would we need to repolarise a dynamo? Well, there are two reasons for repolarising: Firstly the residual magnetic field in the soft-iron core may not be strong enough to get things started, or secondly it might be the wrong way around (i.e. the north and south poles are reversed) causing the induced current to flow the wrong way to the battery. The first condition may occur if the motorbike hasn’t been used for some time as the residual magnetism will gradually fade over time. Alternatively the dynamo may have been knocked or damaged which can sometimes cause the magnetism to be instantaneously lost. An incorrectly polarised dynamo may have been caused by incorrect wiring (e.g. connecting the battery the wrong way round) or the unit could have been previously fitted to another bike which required the opposite polarity. The original Lucas service data sheets specified that all replacement dynamos would be supplied pre-polarised for positive earth motorbikes, and that they would therefore need to be repolarised for negative earth machines. What we are about to do is therefore a very standard procedure and requires very little technical equipment or knowledge. The main indication that a dynamo will need to be repolarised is when everything else seems to be in order with the charging system (see my General System Checks guide for more info) but the dynamo output is still very low, usually after not being used for a while. A negative dynamo output voltage (see my Testing a Lucas Dynamo guide) usually indicates an incorrectly polarised dynamo. So that’s the ‘why’ taken care of, now comes the ‘how’ bit for repolarising your dynamo. All you’ll need is a long (say about 1m) length of wire – that’s about it! The wire needs to be reasonably thick as you’re going to use it to pass quite a big current (albeit it only momentarily) through the field winding of the dynamo. Something like multicore mains wire or battery cable is ideal. Anything too thin might get hot and melt if the current is too large for it. I would advise reading right through this article first as this will take you through disconnecting the battery and dynamo, identifying the relevant connections and checking the existing output voltages. After ‘flashing’ the dynamo, you will also need to repeat the measurements described in Steps 3 to 5 of this guide so it’s worth becoming familiar with them anyway. The first thing to check is which way round your bike is wired, or in other words, which battery terminal is connected to the frame (earth) of your motorbike. If the positive terminal of the battery is wired to the frame then your bike is positive earth – the normal configuration for bikes up until around the 1950’s. 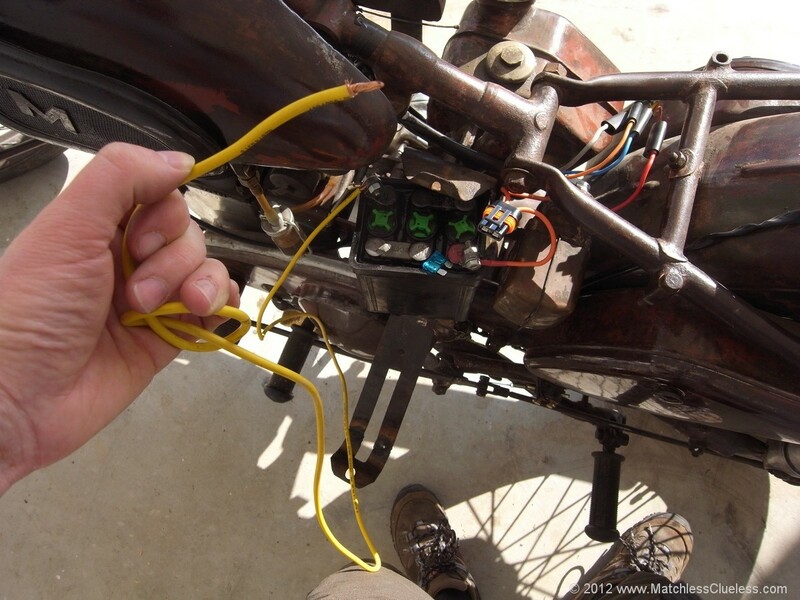 Later bikes and nearly all modern vehicles are wired negative earth, that is to say that the negative terminal of the battery is connected to the frame of the motorbike. It is important to get this right as it will determine which way round you need to polarise the dynamo unit. To try to make this clear, I am going to refer to the ‘Live’ and ‘Earth’ terminals of the battery. The ‘Live’ terminal is the one wired to the ammeter and the ‘Earth’ the one connected to the frame of the motorbike. Ensure the Earth terminal of the battery is still connected to the bike (i.e. it is earthed) but disconnect the Live terminal from the bike. In it’s place connect the length of temporary jumper wire. 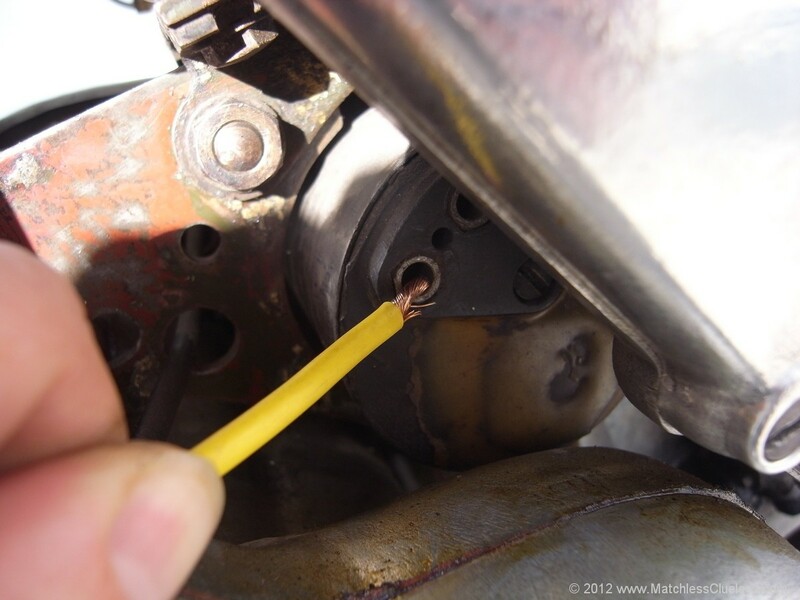 Take care to not let the other end of this temporary jumper touch the bike frame or engine as this will create a short circuit and allow the full discharge current of the battery to flow through the wire which could potentially be quite dangerous to both you and the bike! On my bike, I have a 15A fuse fitted in the earth connection between the battery and the frame (my bike is positive earth and the fuse connection I had was red, so this seemed a more logical way to connect it, although normally a fuse would be fitted to the live side of the battery). The high current drawn when flashing the dynamo will probably blow the fuse so I temporarily swapped it for a higher rated fuse (say 30 Amp). The alternative would have been to swap the fused connection for a direct earth connection, but this would have taken longer and anyway, I liked the reassurance of having a fuse there in case I did something really silly! If you have a fuse fitted to the live side of your battery, then just remove this to effectively disconnect the battery whilst leaving the earth connection in place. Next, carefully identify the Field terminal on the dynamo unit. This should be the one on the left (click on the photo at the top of this article for a close-up view) and is normally marked with the letter “F”. Carefully touch the Live end of the jumper wire to the Field terminal of the dynamo for just a second or so, no longer. You should see sparks as you touch the wire to the terminal, but this is ok (it just shows that current is flowing from the battery). If you don’t see any sparks, check that the earth terminal is still connected to the battery which will form the return path for the current via the dynamos metal case. Also make sure the battery is well charged. Touch the Live wire to the dynamo in this way a further couple of times to complete the ‘flashing’. Immediately disconnect the temporary jumper wire from the battery before it causes an accidental short. That’s it – you have now repolarised your dynamo! Not at all difficult was it? Now go back and recheck the dynamo output using a multimeter as described in my other article and you should hopefully see a nice healthy positive output voltage. If not, please refer to back to the guide for further trouble-shooting ideas. I hope you found this article useful. Please feel free to leave me a comment below to let me know how you get on, if you have any further tips or suggestions, or maybe if you have spotted a mistake. hi! absolutely superb explanation of dynamo/regulators. many many would be teachers could adopt your style an simplicity. thank you very much for this imformation as it made changing from 6v to 12v very easy. all the best ron taylor. Certainly the best description of checking a dynamo I have ever come across. Really informative and easy to understand. Your guides helped me bring the dynamo on my B31 back to life. Thank you for putting this series of articles together. Hello, I have a 6v Lucas E3H dynamo wih the direction arrow anti clockwise, but I need it to charge running in the clockwise direction. Is it possible to use it that way or modify it in some way to charge in a clockwise direction? Hi Pete. Repolarising the dynamo (as described above) should allow it to operate in either direction. Fit it to the bike and check the output with the engine running. If the voltage is negative you will just need to repolarise it the other way round to get a positive voltage output, then it should work fine. Excellent information,just rebuilt a dynamo for A10 replacing internals for 12v,struggled to get positive charge at dynamo,followed the flashing instructions,(still negative)not knowing what to do after about 6tries i i swopped the field coil wires,(still negative) ,flashed it again ‘bingo’ but I don’t understand why.Keep up the good work I know I will be referring to you pages again. Just adding my thanks for a clear consise set of instructions. I’ve always been wary of DC systems, but having fixed the fault in 2 mins flat by “flashing” I’m now a happy teddy! Cheers Andy. Glad the instructions for repolarising your dynamo helped and you managed to get your charging system up and running again. Thank you for posting your very helpful dynamo articles. May ask is it possible to flash the dynamo whilst it is detached from the bike and how one would go about it? Great article, very helpful. One question, I’ve only got a 12V battery, can I use it to flash my 6v dynamo without damaging it? Hello there, I am hoping to use this information to get the dynamo on my ’35 RE model “A” to work correctly. The one currently in use is marked for rotation in the opposite direction to which the bike runs. This bike is coil ignition with the points in the end of the dynamo and so far I have been unable to source one of the correct rotation. Given a charged battery the bike will run reasonably well (for an old two stroke) but it would be nice to get the charging working. I have asked many people and they all say “flash the dynamo across” but nobody could tell me exactly how! I also run a’42 Matchless that I had to have the dynamo rebuilt for, I have fitted a modern regulator to this but got caught out coming home from a run when the battery gave up & I found out that the regulator fitted won’t work unless there is current in the battery. A new battery, an LED tail light and a Halogen bulb have since been fitted to improve the lighting, the only thing is that the charge does not balance until 36 mph now! Many thanks for the information. Andy. I need to flash the dynamo or motor it to establish whether it has been set for + or – earth I intend to run it as a – earth, the dynamo was restored by the someone for the previous owner(bike was in bits when bought) so I am unsure which polarity it is. My question is if I flash it do I have to disconnect it from the AO regulator before flashing it, it’s all assembled on the bike and connected but it has not been run,I thought I should check polarity before running I just assumed it would be – earth !! Not sure, but you might find the drill doesn’t turn it over quick enough, especially if it is just a battery drill. Flashing is pretty much instant so there’s no advantage to flashing it a lot. But it only spins as fast as my cam, because the dynomo is drivin from cam gear. can i use some other 6v generator. A little faster with gearing but its not much faster. Just as a matter of interest the E3L dynamo on my Viper has an extended (D)pole that protrudes through the end cap. Is there a function for this ? Do i need to buy a multimetre to test voltage? even if its not lighting a bulb when dynamo is drivin, ..its been a 15 year project, and this is only thing holding me up from ridding it, any help would be much appreiated . i will go and buy a metre now. Ony getting a small 0.44v out of one wire,when put two together its less, about 0.17v ,when both wires are together and touched with + motor spins fast,. it use to be touch one and motor turned slow, and if i touched the other wire it would just short. somthing has changed… at least im getting some kind of voltage, but hardly enough. wont even light a bulb.. In particular: “If you get a low voltage reading of about half a volt then the service manual suggests that the problem is probably with the field winding.” To be honest, everything I know is pretty much explained on these two pages, so if you are unable to diagnose or fix the fault from this info, then I’d recommend sending it to be reconditioned. Hi c10. So how did you get on? Any luck finding a solution? I conected it according to the instuctions except the repolarizing step. Changing the fuse did not change the situation and it kept blowing out. I have light on my bike but directly from reg and not from the battery that by now is empty. Not having a healthy 6V battery around and wanting to check the 6V dynamo on my Norton 16H positive earth Lucas system (which indeed shows a minus 7-8V reading on fast tick-over), I was wondering if I could use a 12V battery to repolarise the dynamo? After having the dynamo disconnected from the regulator and the rest of the electrics, of course. Many thanks for a superb set of articles. I knew about reploarising dynamos, but have never done this and I will now attempt to jump-start my E3L after its 20 year rest! james-Hi c10. So how did you get on? Any luck finding a solution? Does it matter which way round an E3L field coil wiring is connected and if so, how do you distinguish which side of the field coil should go to earth? By the way – thanks for an excellent & informative web site. James – many thks. I quickly reversed the field coil connections this morning and re-polarised for good measure – and bingo shes charging again with a vengence. I have to admit that previously I had mended something that wasn’t broken (putting in new brushes!) and am paying the price for my incompetence – but thks again for a super informative web site. I bought an unrestored (bodged) 1956 G3LS a couple of monts ago. It starts/runs nicely. The battery was no good and the wiring was suprising in places. Wires connected by twisting the bare ends together and covering with sticky tape (now cured). I replaced the battery with a Cyclon sealed 6v 5ah unit in a battery box. The dynamo appears to charge nicely with the engine running, showing a positive charge on the ammeter. However, when the lights are switched on the ammeter shows an even greater charge rather than the expected lower charge. Can you suggest what may be wrong? Many thanks for your reply received this morning. Yesterday I had another good look at the wiring on the G3LS and tried the headlamp as suggsted in your reply. The ammeter needle showed Positive. So I had another, this time Careful, look at the wiring and saw the wire labelled by the previous owner with a +ive label was the one going to the ammeter. The book says that a 1956 G3LS has a positive earth so the label was misleading. I removed it and connected the that wire to the Negative battery terminal and the earth to the Positive terminal. Of course, everything then worked as it should. A lesson learned here. DON’T trust dodgy labelling and LOOK carefully. With the engine running teh ammeter shows only a small charge probably as the battery is new and fully charged, However with the headlights on the dynamo keeps up with the discharge so it is working ok. Just on case the wrong wiring had caused the dynamo to need ‘flashing’ I did that following your very clear directions. Unnecessary as it turns out. May I say that, as an ex-teacher, I admire the clarity of your writings. I have a 1933 Rolls Royce, it has a dynamo and i need to polarize,wiring consist of A B C A shoes – side field, B shoes + side field, and C is + output armature. can any one direct me how to polarize?, Thank You , GT . Hi GT. The principle will be the same as described above, but you will need to determine which lead is which first, so you’d be much better asking someone more familiar with your Rolls Royce! Came across your website by ‘accident’, I have just bought a 1956 Norton model 50 that has stood for 25/30 years for a restoration project,the info on here is really informative and will be referred to when I get started on it. Very well done! Clear and useful. Thanks very much for sharing your knowledge. Hi James, just wanted to say thanks!You’ve saved me a lot of time and trouble with your excellent instructions! The old bikes charging a treat now. Cheers Steve. If the MatchlessClueless website has been useful, then a copy of my new “Classic Motorcycle Electrics Manual” book would be well worth a read! It’s available on Amazon UK here. The brush holder on my Dynamo has been detached from the stationary coil inside the body. Where do I reconnect the two wires from the coil? Thanks for excellent articles. hi from john.le 200cc 1953 mk2.positive earth.plugs blackening .i have just pulled the millers 6v brass mag of. the spark blue .i have used a spark tester.passiss red white as you you try to go to green. it tells there a fault accuring ? i bought a new carb.4 carbs used.still blackening the plugs.vaults passing through the windings.6.56v .running .6.98v voltmeter not moving only when points open. .as i was just about to send the brass mag of to someone in the club. or could i do it my self. hi james, a great article. Is it ok to repolarise with my dvr2 already in place, thanks mick. The best explanation I have read on dynamo electrics. For once I was cumfterble working on a friend’s 1950 triumph. Top man. Thank you. Your articles are very clearly written and illustrated. I note that the magnetism of a dynamo can be lost over time due to inactivity. Does the same happen to a magneto? I have a Lucas K2F magneto which when I bough circa 20 years ago and had a spark when turned by hand then. The magneto has been on a shelf since and now won’t spark when turned by hand. I didn’t check it since buying it. Any ideas? Thanks James, Happy new year! Many thanks for publishing this. It worked a treat today to persuade my dynamo to start generating again. Simpler way is to take the cover off the regulator and push the coil armature down for a second or so. If you need to reverse the polarity for some reason then reverse the battery connections first. I have a problem with my charge system. When I start the engine I can’t get any voltaje but if with a cable I put together in the control box F and D the sistem starts working but without regulate voltage of course. If I disconect the two dynamo wires and put the multimeter between D and frame y can reed 1.2 v.
Hey James, I am rebuilding a Lucas E3L dynamo, and I cant work out which way to connect the field coil connectors – Any guide on this? Thanks so much for this article by the way – super helpful. Hi Martin. Sorry, I can’t remember of the top of my head, but I’m pretty sure you will find the answer in my ‘Classic motorcycle Electrics’ book if you can get a copy (see Amazon here for example: http://amzn.eu/iW19RY2). There’s a whole chapter covering Lucas dynamos, their connections, repolarising, testing, etc, etc. Sure you would find it a useful read! Thank you for your articles discussing the Lucas dyno. Your diagnostic steps are spot on! 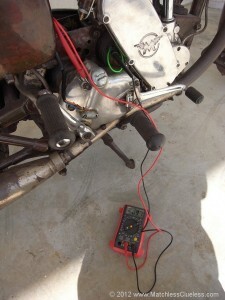 I followed the steps exactly and was able to determine why the E3L on my 1954 Triumph T110 was not charging. Ended up repolarising it and bingo, it started putting out 8v+ at a fast idle. Never had to pull it off the cycle either. I have bookmarked your website and will no doubt be using these treatises again. Learned a lot. Fascinated with knowing about the option to convert to 12v. Wanting. Now to add turn signals to the bike just for safety while riding. At 72, I like keeping both hands on the bars at all times! Any suggestions?